TriMet’s efforts to put reduced fares in the hands of riders on a low-income reached another milestone this week as the number of qualified applicants topped 10,000. Residents within TriMet’s service district who earn up to double the federal poverty level may qualify for our Honored Citizen reduced fare. Enrollment brings a 50 percent discount off single rides and day passes and a 72 percent discount off month passes. That can add up to an annual savings of $864 dollars or more in transportation costs. Printed 8,697 personalized Hop cards. Established 10 public and 17 client-centered community partner income verification sites. Hosted 54 enrollment events across the region. With 10,031 riders qualified for reduced fare based on their income level, TriMet is on track to surpass our first year estimate of 15,000 participants. The projection was based on the performance of low-income fare programs established by peer agencies, including Sound Transit in King County, Washington. TriMet is two-thirds of the way toward meeting our year-one estimate, in about seven months since our program started. TriMet’s creation of a reduced fare program for low-income riders came through an expansion of our Honored Citizen fare. Qualified riders receive the same discounted fare as seniors (65+), Medicaid recipients, people with mental and physical disabilities and youth (7-17). This approach helps keep our fare system simple, streamlined and easy-to-understand. Oregonians, age 18 to 64, who earn up to double the federal poverty level and are not otherwise eligible for Honored Citizen fare are invited to participate in the program. 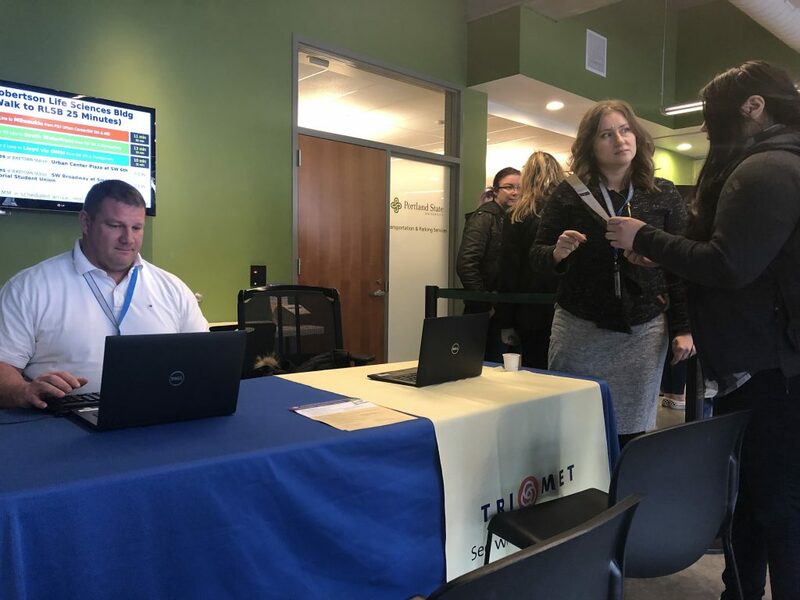 Qualification is quick and easy and can be done at partner verification sites throughout the region, as well as remote enrollment events hosted by TriMet. All you need is a government-issued ID and valid documentation such as a recent paystub or Oregon Health Plan card. Once qualification is confirmed, riders take their income verification receipt to the TriMet Ticket office, where they will receive a personalized Hop card that includes their photo. Money can be loaded to the card at the ticket office, online at myhopcard.com, through the Hop mobile app or at more than 500 retail partner locations. Savings begin immediately. TriMet studied a low-income fare program for several years before securing stable, ongoing funding for it with the state’s adoption of the Keep Oregon Moving law in 2017. See if you qualify at trimet.org/lowincome. Then, visit one of community partner income verification sites or stop by an enrollment event in your neighborhood. Keep an eye on our TriMet Facebook page for information about upcoming events.